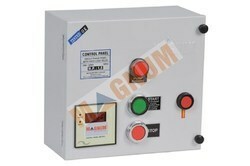 Rugged MaCH/MaK-1 Contactor with wide voltage band (140-220V). Fitted with MaCH/MaK-1 type relay for reliable overload protection. Digital Metering to read Ampere & Voltage in a single meter. Rugged MaK-1 Contactor with wide voltage band (140-220V).